We’d love your help. Let us know what’s wrong with this preview of The Old Garden by Hwang Sok-yong. As South Korea violently changed from a military dictatorship to a democratic state, an idealistic activist and a brazen painter shared a brief love affair that would impact the rest of their lives. Drifting to an old house in the countryside where they once sought refuge, Hyun Woo finds Yoon Hee's letters, diaries, and paintings that document the extraordinary life of the As South Korea violently changed from a military dictatorship to a democratic state, an idealistic activist and a brazen painter shared a brief love affair that would impact the rest of their lives. Drifting to an old house in the countryside where they once sought refuge, Hyun Woo finds Yoon Hee's letters, diaries, and paintings that document the extraordinary life of the woman he loved and lost. He recalls the circumstances that brought him to Yoon Hee and the lifetime they spent apart. As his world shrank in prison, hers expanded as she fought off the loneliness of his absence and witnessed the dramatic events of their country's recent history, the fall of the Berlin Wall in Germany, and the harsh natural landscape of Siberia. He also learns that she has left him a living legacy that will help him find his way again. Hyun Woo is fleeing authorities for his participation in the Kwangju Uprising and for promoting democracy in South Korea when he meets and falls in love with Yoon Hee. Their idyllic time together is cut short when Hyun Woo is captured and thrown in prison. Nearly two decades later, he is released to find Korea aggressively modernized, democratic in name, but filled with inequality and corruption. His former comrades are old and jaded, and Yoon Hee, never allowed to see him during his imprisonment, has died. To ask other readers questions about The Old Garden, please sign up. What does this book have in it? Any explicit content of any kind? What would it be rated as a film? Here’s the story of The Old Garden: A South Korean political prisoner named Hyun Woo is released after 18 years in a cell. He has been almost entirely cut off from a society that moved from military dictatorship to a democratic state still marked by inequality. Upon stepping back into the world, he must re-orient himself to a modernized Korea, as well as to the people he left behind, and the legacy left by the love of his life. This love, Yoon Hee, was an artist who filled notebooks of journals Here’s the story of The Old Garden: A South Korean political prisoner named Hyun Woo is released after 18 years in a cell. He has been almost entirely cut off from a society that moved from military dictatorship to a democratic state still marked by inequality. Upon stepping back into the world, he must re-orient himself to a modernized Korea, as well as to the people he left behind, and the legacy left by the love of his life. This love, Yoon Hee, was an artist who filled notebooks of journals and letters to him while he was in prison. She died of cancer before they could be reunited, three years before Hyun Woo’s release. After escaping the city of Seoul to the small town of Kalmae—where the couple once lived before the arrest—Hyun Woo examines the man he once was, the woman Yoon Hee was, and the consequences of all kinds of commitment in a nation changed. It is especially notable that The Old Garden was the first work published by South Korea’s eminent author Hwang Sok-Yong after he himself was released as a political prisoner. A longtime activist, he was also a veteran of the Vietnam war, drafted into a corps responsible for clean-up for the American forces, or erasing evidence of civilian massacres. In 1993, he was sentenced in to seven years in prison after an unauthorized trip to North Korea. There, he conducted eighteen hunger strikes to protest the banishment of pens and inadequate nutrition. He was pardoned in 1998 by a new president in South Korea, an effort that was buoyed by an international outcry at his treatment through PEN America and Amnesty International, among others. No wonder the world was eager to get their hands on The Old Garden when it was published a couple years later—though the English version only came to us last fall, thanks to Seven Stories Press. The book also spurred a Korean movie that brought it increased attention. For me, the most moving scene in the novel comes early on. Hyun Woo is only days into his life as a free man. He is trying to navigate a busy and expansive public space in Seoul and is overcome by a physical nausea. The book rests heavily in backstory, using not just flashbacks but also the device of Yoon Hee’s journals push us, and the narrator, into the past. Often this is very evocative and it makes sense for the narrator’s mind to brood so long in memory after spending 18 years outside of a world that progressed forward. But sustained over so long of a book—it clocks in at more than 500 pages—the backstory began to weigh on this reader. I got restless. Another odd gap in the novel is that there’s not much space given to an articulation of the political beliefs that were, apparently, so passionately held that our characters would put their lives and freedom on the line for it. There are allusions to it—but no expansive vision. We know our hero participated in the Kwangju Uprising. We see interesting machinations of underground organizers who resisted the government. But this first-person narrative never got around to digging into what he believed and why. Besides being curious about it, so much rides on his activism. But, any political and social belief he has seems to be beside the point in this novel. And when we meet the narrator, 18 years after being incarcerated, perhaps they are. Nonetheless, wouldn’t he brood upon them—especially as he meets the society that emerged while he was cut off from it, comparing it to what he hoped for or feared? Wouldn’t he critique his own beliefs, as he comes to terms with what he lost on behalf of them? Especially for a novel set so decidedly in memory, wouldn’t these beliefs emerge, even if incidentally? I would think so. But in this novel, they don’t. For Hyun Woo, any beliefs he has are so ingrained as to never need articulation. His actions, then, in both the past and present, have an automatic quality to them that I found myself not quite buying. On the other hand, I do appreciate the even-keel of the narrator. The pacing of the book has a patient quality to it that seems appropriate for a man tentatively re-engaging with life. Over the past few years, I found myself increasingly fond of quiet, low-key narrators—such as those in Per Petterson’s Out Stealing Horses, or Marilynne Robinson’s Home. I love being spun into the powerful inward energy of characters that are often un-remarked upon as they slip through the world. Hyun Woo, in his post-prison life, is native to this tribe of understated protagonists, and I love him for it. But I just struggled with comprehending the revolutionary roots with which he supposedly emerged—and given Hyun Woo’s focus on his past, it shouldn’t have been so hard. A garden is a metaphor for revolution. When painstakingly cared for, dry and barren ground can eventually yield the most beautiful of things. A garden can change an unruly landscape to an ordered plot, produce food and purpose, and forever capture the energy of a gardener with loyalty, conviction, and a love of what it could become. It can be simple in activity, process, and outcome, yet incredibly intricate and an entity all its own. Many of us will never live this metaphor and will never have t A garden is a metaphor for revolution. When painstakingly cared for, dry and barren ground can eventually yield the most beautiful of things. A garden can change an unruly landscape to an ordered plot, produce food and purpose, and forever capture the energy of a gardener with loyalty, conviction, and a love of what it could become. It can be simple in activity, process, and outcome, yet incredibly intricate and an entity all its own. Many of us will never live this metaphor and will never have to face the difficulties the characters in The Old Garden must confront. After eighteen years of political imprisonment, South Korean Hyun Woo is freed only to find that the Seoul he once knew is gone and the woman he loves is dead. In this beautifully written book, the author uses her diaries and letters, woven with the Hyun Woo’s attempts to narrate his own past and present, to chronicle a man trying to find footing on the soil he fought to change, and face his choices and regret. The novel’s world renowned and accomplished author, Hwang Sok-Yong has confronted these issues in his own life. Born in 1943, Sok-Yong has been imprisoned and exiled in the name of writing about his country, and his characters emanate a dedication and love of their home that is undoubtedly autobiographical. The author’s vivid imagery and veridical descriptions of the activists hiding “underground,” the aftermath of the Kwangju Massacre ,and torture at the hand of prison guards is affecting. Chills ran down my entire body when I read the main character Hyun Woo reflect, “Was it really possible for us—and there was not even a handful of us, and we were so young—to change the world with nothing but our noble intentions?” This was not just a story; this was something the author had truly lived. But a garden can also be a symbol of more than revolution, and The Old Garden is first and foremost an incredible tale of a tragic love that grew despite all odds. While hiding in the town of Kalmae, Hyun Woo falls in love with a beautiful art teacher and ally of the movement. Beyond the already complex life of a political fugitive, he must now battle issues without a clear right or wrong, oppressed or oppressor, power or people. Must a revolutionary sacrifice their own bliss for the greater purpose? How can a revolutionary reconcile that he or she will most likely never experience what they fought to win? During one of the most poignant and meaningful moments in the story, he reads his lover’s diary entry about a day they washed laundry and fished in the sun. She writes, “What seems so insignificant, the everyday tasks of a simple life, is in fact the most important part, isn’t it?” The answer is yes, but for the revolutionary, it is anything but simple. To survive the unfathomable emptiness in prison, Hyun Woo manages to grow a small garden beneath his crumbling cell wall with seeds gathered from rare trips outside of solitary confinement. Despite the lack of sun, of good water, and of real soil he is able to keep the small plants alive, relishing their growth and nurturing them constantly, until the winter comes and frost covers his walls. And while the conditions may have killed each flower and destroyed any lasting life, it was in the gardening itself that he found meaning. The Old Garden begins in the present (at the time the novel was written) with the release of the protagonist, Oh Hyun Woo, a political opponent of the South Korean dictatorship, after almost eighteen years of imprisonment. Near the beginning, he discovers that his lover, a teacher and artist, Han Yoon-hee, whom he has not seen since a few days before his arrest, has died of cancer a few years earlier. He returns to the house in the country where they lived together and finds her journals and uns The Old Garden begins in the present (at the time the novel was written) with the release of the protagonist, Oh Hyun Woo, a political opponent of the South Korean dictatorship, after almost eighteen years of imprisonment. Near the beginning, he discovers that his lover, a teacher and artist, Han Yoon-hee, whom he has not seen since a few days before his arrest, has died of cancer a few years earlier. He returns to the house in the country where they lived together and finds her journals and unsent letters to him. The remainder of the novel is primarily flashbacks based on his memories and her writing, in a complex chronological structure reminiscent of the novels of Mario Vargas Llosa (especially La fiesta del chivo) but without the intentional disorientation of Vargas' writing. The way the novel is structured rules out any element of suspense as we know in advance that he will be captured and that she will die of natural causes without seeing him again; this focuses attention on the political ideas and the emotional reactions rather than on the plot. The book initially concentrates on the events from 1981 on, starting with the aftermath of the Kwangju uprising, although for example through Han's memories of her father there is some context going back to the struggle against Japan. We see Oh as an underground activist for the next year, finally escaping to a refuge in the countryside and falling in love with Han, whom he lives with for a few months before "survivor's guilt" after his comrades are all captured or killed impels him to return to the now hopeless struggle in the capital. His experiences in prison are counterposed to her life on the outside, first waiting for him in the country, then returning to graduate school, and spending a few years in West Berlin as a student before returning home after the reunification of Berlin and the end of the Cold War. The tearing down of the Berlin Wall provides an emotional contrast to the still divided Korea. This is a pessimistic book, as any realistic novel today must be; the capitalist liberalization of South Korea, which results in Oh's liberation as an old man, is shown as anything but what Oh and his friends had hoped for, and both the united Germany and the former Soviet Union are described as rather dystopian; and of course Korea was (and still is) divided between a poor and tightly controlled North and a corrupt and materialist if no longer dictatorial South. Nearly all the characters are tragic, dead or broken. It left me rather depressed. It's also a very powerful book, and I learned much that I did not know about the recent history of South Korea. A melancholy love story set against the backdrop of the political and emotional fallout of the Kwangju massacre. I'm impressed that the novel was translated into English, but don't understand why no translator is credited. Lyrical, evocative, at times repetitive, a masterwork. This work takes its time to build up steam. A long, leisurely read that is both artful and brutal. The subject of the book is Korean dissident and political prisoner in 60s-90s South Korea. Part epistolary novel it alternates between the prisoner and letters written to him to be read posthumously authored by his wife. I learned so much about Korea (about which I was/am woefully ignorant). I have never read a work that I would call art literat Lyrical, evocative, at times repetitive, a masterwork. The subject of the book is Korean dissident and political prisoner in 60s-90s South Korea. Part epistolary novel it alternates between the prisoner and letters written to him to be read posthumously authored by his wife. I learned so much about Korea (about which I was/am woefully ignorant). I have never read a work that I would call art literature that also was so disturbing at times. 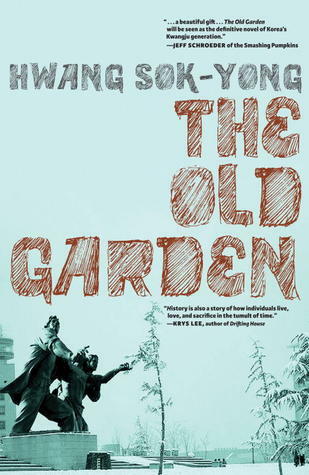 Thought-provoking, profoundly moving, and at times heartbreaking, the Old Garden is a masterful book set against the backdrop of the 70's/80's student movement in Korea. It is one of my favorite books. Beautiful, graceful, tragic- gives a good stirring to my soul. About a great love, of a country, a state, and lovers. Love the writing, will check out more of the author's books- and he may well be one of my favourites. Picked this book of the shelves in the library- ah, the loveliness of paperbacks. Such a beautiful story, well-told, well-crafted. I know if I were born in another era, I would easily be one of those fiesty students participating and maybe even leading protests. Somet Beautiful, graceful, tragic- gives a good stirring to my soul. About a great love, of a country, a state, and lovers. I know if I were born in another era, I would easily be one of those fiesty students participating and maybe even leading protests. Something so hot blooded, wild and strong about the passion in what we can believe in, even when we know we may be so insignificant and are doomed to fail. All the things I have learnt are coming into focus in university. Sometimes you just sit there and feel the gravity and immensity of the things people have done. The thoughts they had. The revolutions. The fighting. The enlightenment. All the strong forces in society- where are these now? Where is the thing I should care for with all my might? I do not want to do the paper chase, nor participate in 'normal' life. I don't really see myself as superior or more intelligent- it's more like where do I fit in this puzzle and when will I figure out what I was born to do? "There are two important days in your life: The day you were born, and the day you find out why." I was made for something- but what? This book was great- throw in familiar ideas and names like Marx and Kant and all that and I'm hooked. Prison life + tragic, but muted love story.. :'( Throw the rainy weather into the mix and I just feel so much. Earlier in the day I came across this passage and kind of wanted to cry. "I turned to my side and touched her hand, so fragile, like water. it moved, writhing softly. Two eyes tightly shut, and what seemed to be just a trace of a mouth flinched and winced, as if she were smacking her lips. " After a few months the leading lady of the story gave birth , while her lover/fiance was shut in prison. For life. Then what got me pretty excited was the entire Berlin wall thing- god it must have been.. a really amazing time. To see it crumble. What a historic, symbolic sight! And nobody was prepared for it- it's amazing how the craziest things can happen just overnight. In a flash. In a glimpse. C'est plus 3.5 que 3. Le Vieux Jardin est un livre génial. L'intrigue est très intéressante, l'écriture très belle, les personnages sont bien pensés, complexes, avec une vraie dimension humaine. Après toutes ces éloges, vous vous demandez certainement pourquoi que 3.5/5. Et bien parce que le contexte de l'histoire est plutôt compliqué pour quelqu'un étranger à l'histoire de la Corée. Et que comme beaucoup de roman, l'environnement où évoluent les personnage est une toile de fond, tout n'est pas C'est plus 3.5 que 3. Le Vieux Jardin est un livre génial. L'intrigue est très intéressante, l'écriture très belle, les personnages sont bien pensés, complexes, avec une vraie dimension humaine. Après toutes ces éloges, vous vous demandez certainement pourquoi que 3.5/5. Et bien parce que le contexte de l'histoire est plutôt compliqué pour quelqu'un étranger à l'histoire de la Corée. Et que comme beaucoup de roman, l'environnement où évoluent les personnage est une toile de fond, tout n'est pas extrêmement détaillé. C'est donc une époque qui m'est complètement inconnue et au final, je me suis souvent perdue dans cette histoire, me demandant ce qui c'était réellement passé pour que les personnages en arrivent là. Et, lorsque je lis un livre historique ou non, je préfère ne pas faire de recherches sur le contexte, ou autre, car j'aime recevoir l’œuvre comme elle a été écrite par son auteur. C'est peut être un peu bête surtout pour ce roman que je pense ne pas avoir apprécié à sa juste valeur. Les personnages de HWANG Sok-Yong prennent place après le soulèvement de Gwangju. les citoyens se révoltèrent suite à l'assassinat de PARK Chung-Hee, Président de la Corée du Sud, et au coup d'état de CHUN Doo-Hwan. Les répressions de l'armée sur les manifestants a été très dures et ont fait de nombreuses victimes. Plusieurs personnes ont été arrêtées, puis exécutées ou emprisonnées. C'est donc l'histoire de O Hyônu, qui au début du roman sort de prison après avoir été incarcéré 18 ans en tant que prisonnier politique. Il se trouve donc confronté à un changement brutal de la société dans laquelle il avait vécu. Il apprend également que la femme qu'il aimait est morte et découvre sa vie à travers ses lettres et ses carnets. Ce parallèle entre la vie passée de Yunhi et la présente de Hyônu est excellent. C'est ce que j'ai préféré dans ce livre. Although this is a tragic and moving love story that also deals with heavy historical and political topics, I found it to be approachable and easy to read. This story is set during the Kwangju massacre in Korea, and in its aftermath. I'd recommend this book for anyone interested in Korean history as well as other expats who live or have lived there. A really interesting perspective on what happened not too long ago in Korea. Good book, but a tad too long. I liked the format as the story is revealed through her notebook/diaries, while he tells his own story. Very sad. Was it worth it, that kind of sacrifice? We will never know. Loved this book- it goes into my archives as one of the must read for my kids. So hard to get through. Make sure you have knowledge of Korean history before you start this book or it will be very confusing. Checked the ebook out of the library with the Overdrive app. There are quiet moments (the cadence is patient, to say the least). I felt it didn't need to be as long as it was...but valuable reading for the historical context (Gwangju Massacre and its wake). He was born in Hsinking (today Changchun), Manchukuo, during the period of Japanese rule. His family returned to Korea after liberation in 1945. He later obtained a bachelor's degree in philosophy from Dongguk University (동국대학교). In 1964 he was jailed for political reasons and met labor activists. Upon his release he worked at a cigarette factory and at several construction sites around the country.